In the last days I got shocked a few times... but not in a bad way. 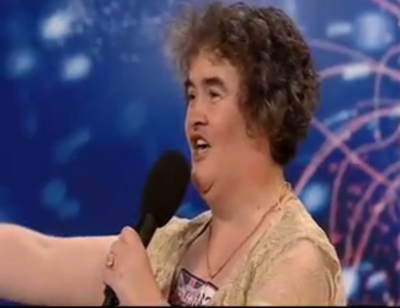 It started a week ago when I saw Susan Boyle chasing her dream of becoming a professional singer. If you didn't see her performance on "Britains Got Talent", you really have to watch it! She doesn't look like and everybody was laughing when she came on stage, but once she started to sing, the crowed went bananas! It was stunning! The next I saw was an incredible goal of Christiano Ronaldo in the Champions League game against Porto. If you have ever played football yourself, you know this is an unbelievable shot. 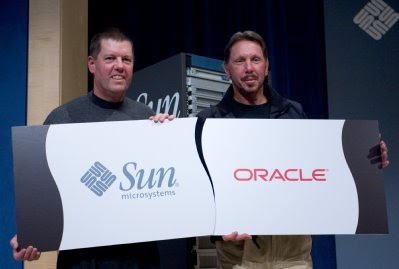 And then yesterday the announcement that Oracle is going to buy Sun. Oracle is growing at the speed of light. When I thought they would stop buying companies, every other month there is a new announcement. But buying Sun has huge implications as now Oracle can deliver everything; hardware, OS, database and software. Another interesting note is that MySQL becomes a database from Oracle now. And what about Java; will that be renamed to Oracle Java? I'm not sure what this will bring for APEX, maybe it can replace all the MySQL/PHP solutions? My guess would be Oracle will offer a migration project for these solutions to the Oracle DB as that will bring more revenue. Anyway, in times of economic crisis, amazing things are happening! 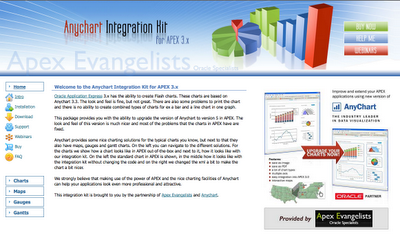 We're happy to announce that a new version of the Anychart Integration Kit for APEX is available now. This release works with Anychart 5.1.2 and 5.1.3 and it fixes some issues of previous releases. As with the previous site, a lot of demos are available. The integration kit helps you to make nicer charts. 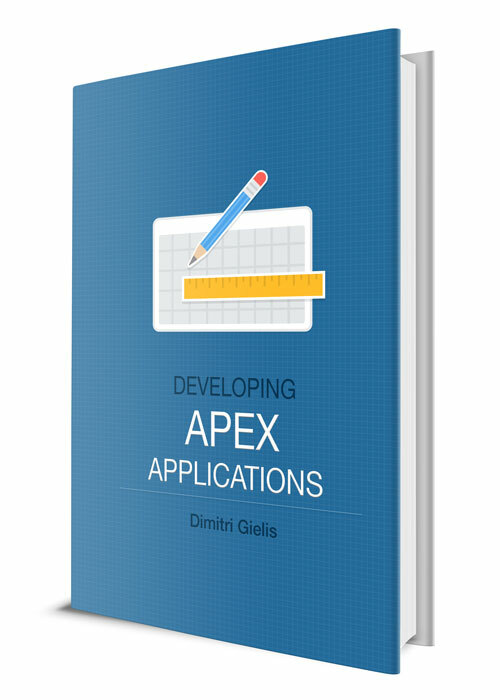 It not only gives your old standard APEX charts a cleaner look and feel, but it also allows you to create other types of charts. A complete list of charts you find on the Anychart website. Next to the charts we included a section for Maps, Gauges and Gantt charts. These sections we'll update regularly. We plan to offer more webinars about these charts as well as how to create interactive dashboards. We also created a section to log Bugs and Enhancements for this integration kit. If you go to the Support section you'll see a link at the bottom. It allows you to log your own issue or to have a look at other known issues. We hope you like this new release and the new site! John Scott, Scott Spendolini, Patrick Wolf and myself prepared a really good APEX agenda for Kaleidoscope 2009. It will be the biggest APEX event so far! If you are quick you can still profit from the early bird registration. 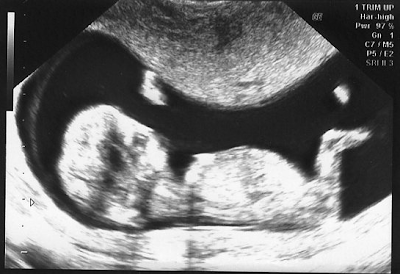 My wife is giving birth in the beginning of July and the risk to miss that is too high, especially because Belgium is so far away. Next to that it would be too hard for my wife to stay alone with our son. So I'm a bit sad I'll miss ODTUG this year especially as I love ODTUG and APEX so much! I always like to meet all the people I meet on the internet. But I comfort myself I'll meet some of you at IOUG Collaborate in May or Oracle Open World in October this year... and I'm sure ODTUG next year will work further on the success of this year! To be honest it was a really hard decision for me, but when I saw the below picture I knew there was only one right decision... I hope you understand.